The abuse my nails suffer through is ridiculous. My nails never go unpolished. Ever. Well, maybe for a day or two tops. But then, polish again. I know we are meant to give them a break but I just can't help it. 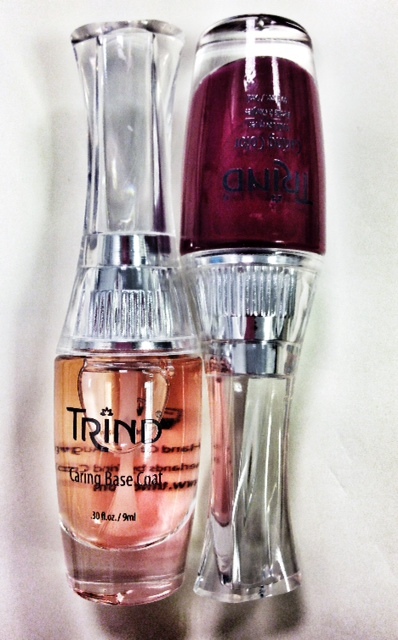 I laid my eyes on Trind, and specifically, the perfect cuticle and nail treatment kit. As opposed to the usual cuticle oil or balm, which I have a ton of, this trio treat and moisturize your nails in three different ways. I also got my hands on their base coat and color that is perfect for this festive season - a deep berry red that I can't wait to try. The nail repair strengthener (white) acts a base to the base coat and is to be used daily for 2 weeks, after which it can be used once weekly. I don't know if I will be able to apply it daily especially if I have polish on all the time, but I will definitely take it with me whenever I get a manicure or a polish change to ensure it goes on to my clean nail first. I read on a blog somewhere that it works great to rejuvenate nails after they have been stripped off Shellac or acrylics, restoring the natural element of the nailbed. Sounds good to me! The nail balsam (light turquoise) is a product concept that never crossed me before. I used to own a nail lounge and such treatment was almost unheard of. The balsam acts as a coat of treatment that you apply and leave on for 2 minutes then massage the rest on your nail. The website claims it non-oily but since I have polish on now I can't really try it. It smells real good though and this too is going into my handbag for my next mani/polish change. It seems like an extra step to prep the nail for the abuse it's about to receive in terms of polish. It will set you back a few minutes but it's a worthy cause. I tried the cuticle balsam (peach) because this can applied over polish. After a quick shake to the bottle, I opened it and the nicest floral scent wafted through the air. It applies pretty evenly and doesn't feel too thick on the skin. I only dipped the wand once per hand which this product lasts long. Fast forward 4 minutes later, the cuticle balsam has been absorbed into my skin without any sticky residue. My fingertips smell great, and most importantly, my manicure (which is 5 days old) looks like it was done an hour ago. Stay tuned for the sequel to this post when I actually try the polish and the remaining treatments. 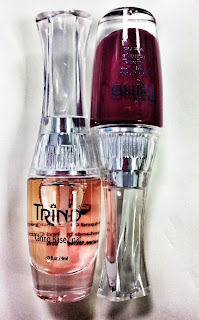 Trind is currently available at Dessange (used in treatments and sold), as well Head2Toe, Lavish Nails & Body Couture, the Kempinski Grand & Ixir Hotel, Diplomat Radisson Blu, Joz Salon and sold at Bahrain Pharmacy. Retail price: BD11.500 for the trio, BD5.5 for polish. like ωhat you're stating and the way in which you say it. You make it entertaining and you still care for to keep it wise. I can not wait to read much more from you. This is really a terrific site.